These Pet Rescue level 659 cheats and tips will help you beat level 659 of Pet Rescue. 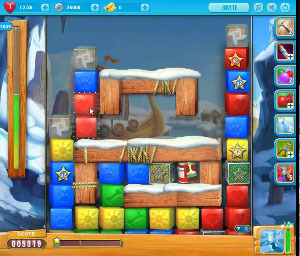 The objective of Pet Rescue level 659 is to clear 100% of the blocks and get 3,000 points. The board in Pet Rescue Saga level 659 has glass blocks and mesh blocks scattered around. Look to break through the mesh blocks to unlock the star blocks and create combinations. Inside the glass blocks you will find fans. Drop the glass blocks onto the wood planks in order to open them up. Once they are open, look to activate them when they will clear out the lone color blocks. Since you need to clear out 100% of the blocks, look to make large combinations to help you do this more efficiently. Look around the board for combinations that will do the most damage to the board. After you make a large combination, look around the board to see how it affected the other blocks. In this level you will be given a paint brush on the board and the paint brush booster. Look to use these when you reach the bottom of the board. The paint brush will help you to clear out any remaining lone blocks at the end of the level.